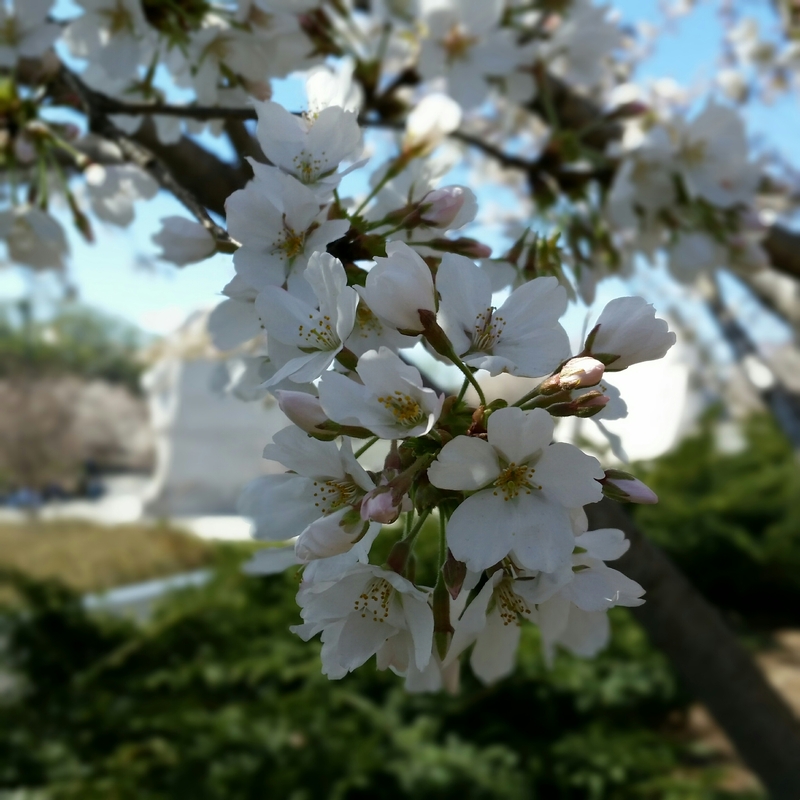 Horticulturalists at the National Park Service are predicting that the cherry blossoms around the Tidal Basin here in D.C. will peak sometime between this coming weekend and the following Tuesday. One of the methods by which they make this prediction is by gauging the stages of development of the buds on the indicator tree and then comparing that to the development of the buds on the other trees. 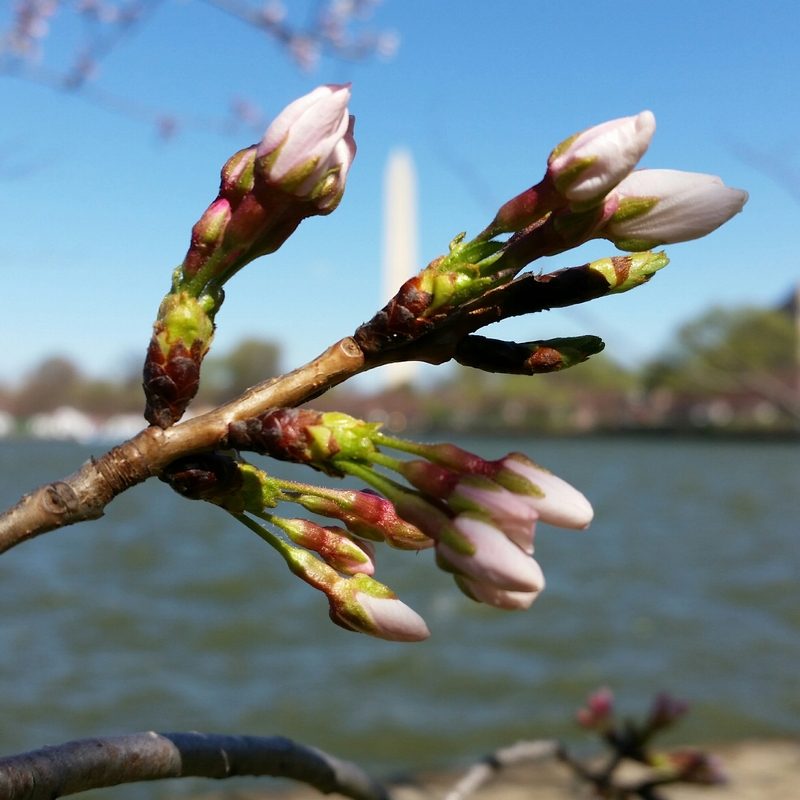 There are basically four stages of development for cherry blossoms before they reach their peak bloom. The first stage is referred to as the green buds stage. This stage, when green color begins to be visible in the small brownish buds, usually occurs between late February and early March. 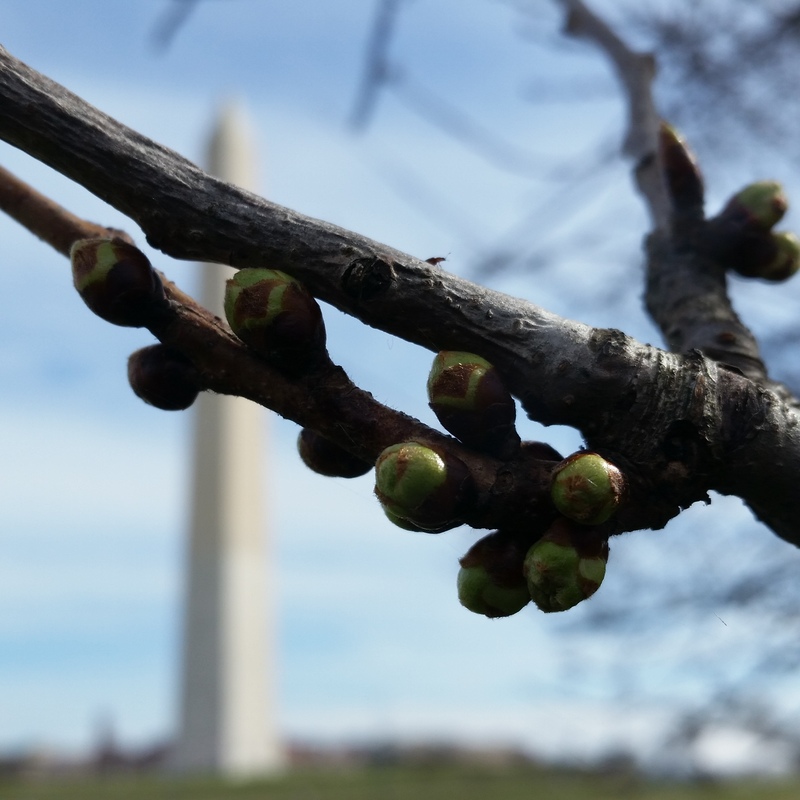 Cherry blossoms emerge before the leaves on the trees do, and the first sign of their impending arrival are green buds on the branches of the tree. In the second stage of development florets begin to be visible as the buds slowly open. This routinely occurs from early to mid March, and anywhere between 12 and 17 days before peak bloom. The middle stage is referred to as peduncle elongation. This may be my favorite stage for no other reason than just because of the name. This is when the blooms grow stems and emerge outward from the buds. When this stage occurs it is usually about 5 to 10 days until peak bloom. However, this stage is very susceptible to weather, particularly frost, which can delay the process. The last stage of development before peak bloom is referred to as puffy white. This applies to all blossoms, regardless of color. This averages between four and six days prior to peak bloom, and is characterized by the blooms begin to open up. Finally, the tree’s peak bloom arrives. How long the bloom last depends on how long they have been exposed to cold temperatures. A warm spell in the 60s or 70s will produce blooms lasting four to five days, while colder temperatures could extend the blooming period so that it lasts between seven and 10 days. Interestingly, during the blooming stage not all blossoms remain the same color. Many are dark pink when in bud, lighter pink when they first blossom, and then eventually pale pink or white. Others may open as a white flower and change color to pink over the course of a few days. The entire blossom season is relatively short. Full bloom, known as mankai in Japanese, is usually reached within about one week after the opening of the first blossoms, or kaika. Another week later, the blooming peak is over and the blossoms are falling from the trees like snow from the sky. Strong wind and rain or other adverse weather can cut the blooming season even shorter. So don’t hesitate going. If you do, you may be too late. Note: After enlarging it, see if you can find the photo-bomber in the photo for the Green Buds stage. 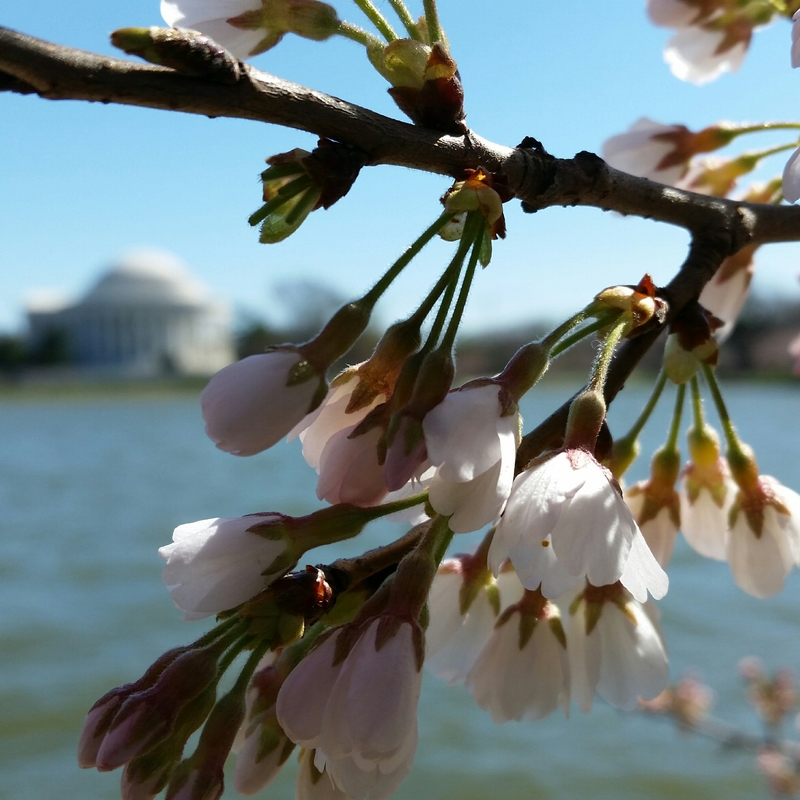 There are approximately 1800 cherry trees surrounding the Tidal Basin in West Potomac Park. And every year the visual spectacle of their blooming draws tourists from all around the world. The most recent estimate by the National Park Service is that they will reach peak bloom between March 17th and 20th this year. 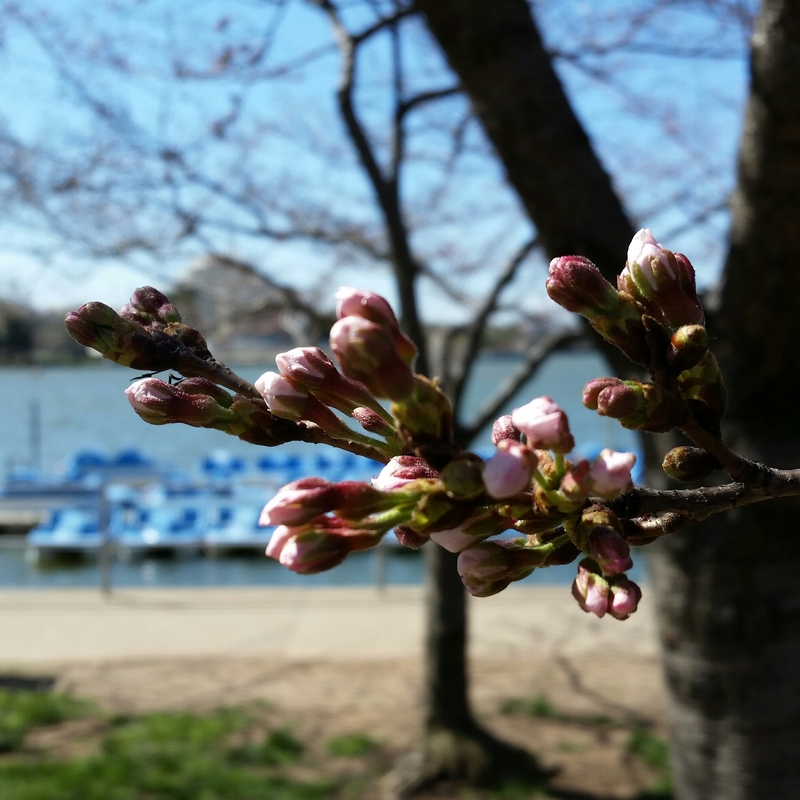 Peak bloom is the day when 70 percent of the blossoms are open in the trees around the Tidal Basin. If the Park Service is correct, this year’s peak bloom will be quite early. In the past, peak bloom has occurred as early as March 15th and as late as April 18th. Because different trees can bloom ahead of or behind the average, the entire blooming period can last up to 14 days. However, frost or high temperatures combined with wind or rain can shorten this period, which includes the days leading up to peak bloom. However, there is one particular tree that is consistently a week to ten days ahead of most of the others around the Tidal Basin. Because of this distinctive trait, it has become known as “the indicator tree”, and it is used to get an idea of where the other trees will be in a week to ten days. It’s also one of the key pieces of the puzzle that the Park Service horticulturalists use in making their predictions. There are no signs indicating which tree is the indicator tree. So unless it happens to be covered in blossoms while the other trees around it are not, you really have to know how to find it. Here’s how: From the south end of the bridge on Ohio Drive looking towards the Jefferson Memorial, the walkway splits into two, with one path to the left going alongside the road and another path to the right, which then splits into two as it approaches the water of the Tidal Basin. The indicator tree is where the path to the right splits into two (MAP). It’s the first old-looking tree you come across and is standing right next to a large holly tree. It’s not the most majestic of the old trees. Not even close. And it’s been severely pruned over the years. But for whatever reason, this tree can be counted on to provide advance warning of the much-anticipated peak bloom. On today’s lunchtime bike ride I stopped by to see the indicator tree. The tree seemed to be several days, or maybe even a week or more away from blooming. Also, the weather prediction is also calling for colder weather, including possible snow or wintery precipitation later this week, which may impact the timing of the peak bloom. So if my reading of the indicator tree is accurate again this year, the peak bloom may occur later and the Park Service’s prediction may have to be revised. I am fortunate enough to be able to see the cherry blossoms every day, from the: initial green color in the buds; to when the florets are visible; through the peduncle elongation stage; and when the buds turn puffy white; and then, finally, when they are in full or peak bloom. But if you aren’t as fortunate and are traveling here from out of town to see the blossoms, keep checking to see if the Park Service revises their prediction. However, as it stands now, the park service says you should be here in D.C. starting on March 17th. And since that’s St. Patrick’s Day, you should consider stopping by the Irish embassy and/or having a green beer and a Reuben at one of the city’s many Irish pubs while you’re here.